“Wow! What a whirlwind that weekend was! Setting off on Saturday we were so excited. Then came race day and the nerves really kicked in! We registered, got all our numbers, stickers and time chips then set up our gear in the transition area. Nerves seemed to settle down as the morning went on and our 12:00 start time approached. First up was the swim, feeling ready and excited again I made my way into the lake with all the others in our wave. Fluorescent pink swim cap, goggles and wetsuit on, the water thankfully wasn’t too cold. The swim went quite well although I began to drift to the wrong side slightly on the way back to the start which set me back a minute or two. Exiting the water, I almost fell back in like lots of others. Thankfully there was someone there to grab on to!  I then made my way to the transition area and got ready for the cycle. Trying to dry my feet was futile, so on went my socks and shoes before donning my helmet and sunglasses. Bike untracked, I walked out to the mount line and almost immediately the bike chain came off. A very kind man watching the race quickly set it back in place without being asked and wished me luck while sending me on my way. I can’t have made it very far before I got off the bike due to the steady incline and feeling like not one gear was working. I kept trying to ride then walking with my bike again and again until I admitted defeat on the hills. Each hill I found myself walking with my bike. I could have easily said no thanks, I don’t want to do this and given up at that first hurdle. But I didn’t want to give in. I didn’t want to let myself down because it was the easy thing to do. Every time the course flattened or went downhill, I got back on my bike, picking up as much speed as I could to make up some time. The mental battle of keeping going was harder than walking the bike around most of the 5 kilometre course for the two required laps. 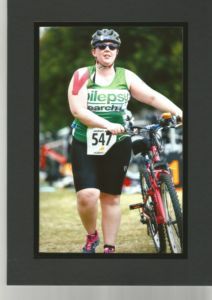 I was so relieved to eventually finish the bike course! Approaching the dismount line I managed to ride over about four cones and come to a screeching halt just in time!  I took my bike back into the transition area and put it back on the rack, switching my helmet for a water bottle and started for the run. My body seemed to have made the decision for me that I would walk it. I was content with this anyway and I walked for the next 2.5 kilometres, smiling at photographers and sprinting to the finish line while being cheered on by Emma, who had already finished. The whole race had a fantastic atmosphere, competitors cheering each other on and giving words of encouragement as they whizzed past on bikes and ran by me. Even if I was the one being left behind them, I found myself doing the same for others, returning their encouraging smiles and quickly chatting. What a feeling crossing the finish line! 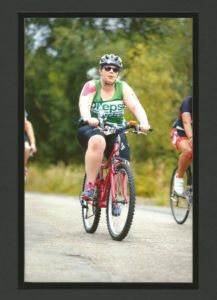 I am completely hooked and have already signed up for a longer triathlon next May and began the training today. I’m determined to be prepared for the next one! Thank you for sharing your story Jude, and thank you for being part of Team ERUK!